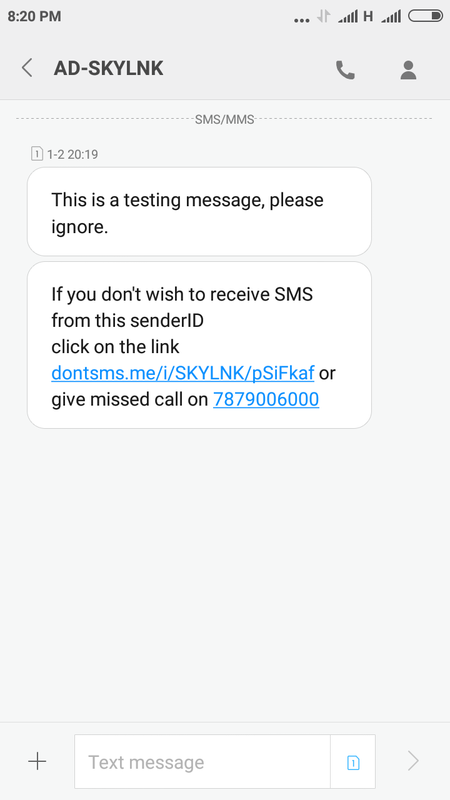 As per the rules of Telecom Regulatory Authority of India(TRAI), OPT-OUT SMS is sent to every DND number so that the user can unsubscribe receiving SMS from a particular sender ID. Every country has strict rules and thus, according to the rules in India we send this SMS on your behalf. This SMS differs on the basis of every country's rules. How receiver can unsubscribe: If the user will go through the link provided, then he will be able to confirm his choice of opting out and if he wishes then he can also give a missed call to the number provided in the same message both the methods will result in blocking the number for future messaging. Why is OPT-OUT important: This SMS is an additional security to avoid the risk of complaints. If you are unable to provide proper registration details, you will be charged Rs. 25,000 for every complaint. Note: This SMS will be sent every 3 months for a particular Sender ID. How to stop this service: In case your SMS is purely transactional, like banking, OTPs etc. You can request us to remove the OPT-OUT SMS by sending us a mail at support@msg91.com and we will remove this feature from your account.